Star Shower Light Salmon and Teal Cellophane Roll 24 inches wide x 50 ft long. 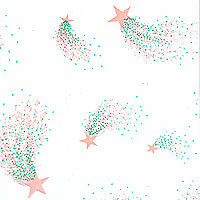 Light salmon color stars with light salmon and teal sparkle showers as if they are in flight. Background is clear.